1. The Soufull 8-inch Chef knife is designed for professionals including chefs, culinary experts, food caterers as well as an ordinary person. 2. It is a chef knife that designed to be multipurpose knife, and it's a perfect tool for chopping, slicing, cutting and dicing. 3.The chef knife features a toughened Japanese stainless steel 8-inches blade. The steel blade contains 0.6%-0.75% for more strength and durability, and consists of 16%-18% chrome material to ensure the knife is resistant against rust/corrosion and won't rust. 4.The seamless construction and smooth polished contours ensures no food or germs can get trapped. Why Choose Soufull 8-inch Chef Knife? ★High Quality Material: Ultra sharp stainless steel (not VG10 Damascus) is a premium material type which can remain the sharpness of the knife for a long time. ★Ergonomic Pakka Handle: The weight and the size of the knife feels quite balanced and you won't feel finger numbness because of it's ergonomic handle. 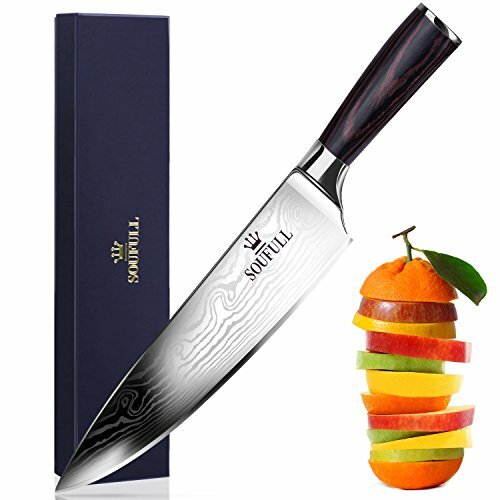 ★Gift Box: This Soufull chef knife come with a beautiful new black gift box so it is very suitable as a gift to your relatives or friends. ★Beautiful Pattern: The blade of this knife feature a special waved pattern, which makes it more attractive . Do not use your hand to test the sharpness. Do not shock, heat, pry, strike the knife. After use, please clean the knife. HAND-WASH your blades with gentle dish soap, rinse clean and towel dry immediately. HIGH QUALITY MATERIAL- This chef knife features an ultra sharp Japanese super steel cutting core at 57+ Rockwell hardness: extraordinary performance and perfect grain. Premium high-carbon stainless steel ensure exceptional strength, durability and perfectly balanced. ERGONOMIC PAKKA HANDLE- To achieve minimize any fatigue, finger numbness or aches after holding it for a long time, the Soufull Chef Knife's handle is made from Pakka. It's known for its comfort, strength and stability. Ideal for people who frequently use for cooking. ANTI-CORROSION- This chef knife also use of 16-18% chrome in the blades' metal composition. This can maintain a good brightness which will not fade or tarnish even after using it for a long time. MULTI - FUNCTIONAL KNIFE- You can use it for cutting, slicing, dicing and mincing.